On the 20th of June 2018, the European Parliament’s Legal Affairs Committee (JURI) ignored all advice and voted for the chaotic Article 13 of the proposed Copyright Directive. There are several steps for the EU institutions to go through before the Directive can finally be adopted. We can still win! The Committee voted to give itself a mandate to negotiate a final deal with the EU Council (the EU Member States). If a political group or a group of Parliamentarians opposes this mandate, a vote of the full Parliament will be needed. This scenario is very likely to occcur and the vote would happen sometime between 3 and 5 July. If the mandate is finally approved, negotiations will take place between the Parliament and Council to reach a final deal. This process has no formal timeline. However, the Parliament side will be keen to reach a deal quickly (as it would be uncomfortable if such a bad proposal was voted too close to the May 2019 elections). So, this process could end as early as October. The text will then be checked for legal coherence and translated into all EU working languages. This process can take a month. 4. Final Parliament vote (December/January). 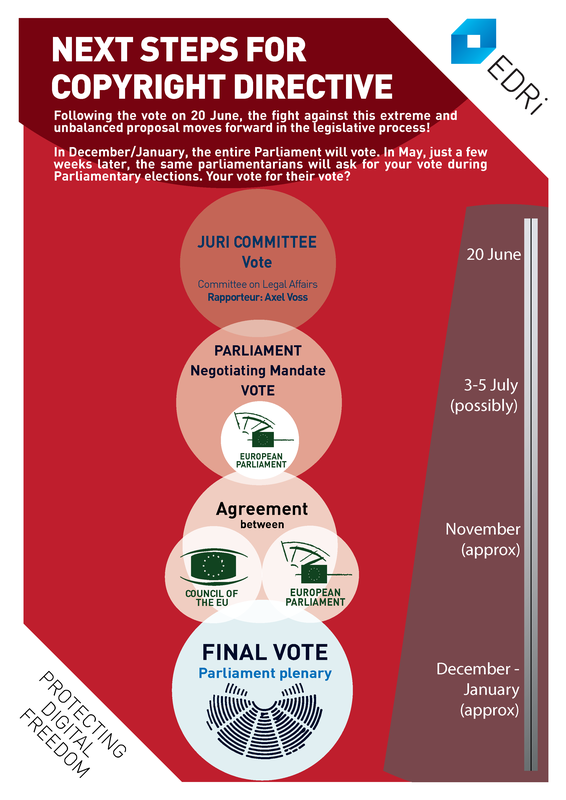 The final Parliament vote will be the end of the legislative process. This is likely to happen in December/January, when MEPs will decide whether or not to oppose the views of voters, academics, universities, internet luminaries, the UN Special Rapporteur and others. Will they vote for you? In May 2019, they will be asking you to vote for them.